The materials backing the raid on Michael Cohen released yesterday suggest — give the large swaths of redacted pagers — that the investigation into hush payments continues. But the filings also suggest something about Mueller’s investigation. One of the earliest warrants, dated February 28, 2018, obtained access to a USB drive holding the contents of Cohen’s Gmail account from June 1, 2015 to November 14, 2017 and a business account handed to SDNY from Mueller. The Agent’s affidavit (starting at PDF 36), describes how Mueller got access to those accounts in support of false bank entries, money laundering, and two foreign agent charges, then substantiates the need to access the same information in support of conspiracy, false bank entires, and bank fraud charges. SDNY does not cite FARA or 951 among the crimes it was investigating. Nevertheless, the affiant describes how the government came to be interested in Cohen’s Essential Consulting account, an account at First Republic that he hid when negotiating how to deal with his taxi medallion business. The account must have come to Mueller’s attention because of the FARA/Foreign Agent interest. [T]here is probable cause to believe that Cohen’s statements and the intended purpose of the account and source of funds for the account were false. Specifically, the account was not intended to receive–and does not appear to have received–money in connection with real estate consulting work; in addition, the account has received substantial payments from foreign sources. A redaction about a third of a page long follows. Following the description of Columbus Nova, there is a redaction. The affidavit then describes that emails and interviews with people at AT&T and Novartis show that the payments were associated with political consulting and notes that they may violate FARA, which this affidavit was not intended to investigate. 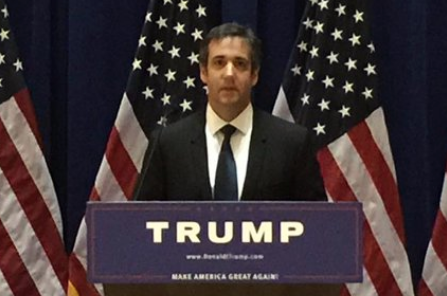 10 Based on my review of public sources, I have learned that Cohen is not registered as a lobbyist or a person acting as an agent of foreign principals, as may have been required by the Foreign Agents Registration Act. 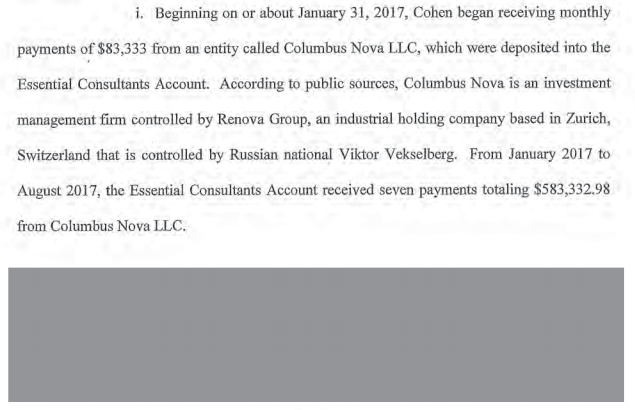 In other words, even in the first affidavit, the SDNY Agent includes Columbus Nova, but then drops that out when he substantiates that the account was used for something other than Cohen had told the bank. One way or another, any FARA exposure related to KAI and BTA were still in DC. But Columbus Nova was treated differently than the other foreign entities. And the discussion of why remains redacted. That may be because nothing ever came of it — though almost $600K is hard to explain away. Remarkably, Republicans remained silent about this payment during Cohen’s congressional testimony, even while they made a big deal about his payments from KAI and BTA. The 18 pages of still-redacted discussion of the hush payments is interesting, because it suggests SDNY continues to pursue that prosecution, a prosecution that features a recording of Donald Trump admitting criminal intent. But the small redactions around the Columbus Nova payment are far more interesting. I can see why they might dispute it, considering the US sanctioned Renova Group, which Vekselberg launched in 1990 as a joint Russia-US venture company, and has donated large sums to various American charities and projects, including a Calfornia park and money to Clinton election campaigns. Reportedly, Vekeselberg who was at the same RT anniversary dinner as Putin and Flynn, first met Cohen on the 26th floor of the Trump Tower, and actually on three occasions, before he offered him a $1 million consulting contract before the startup of the Trump administration. Famously, he predicted before any other Russian oligarch connected to Putin, that US sanctions relief on Russian-owned business and banks would be a slow-go. Guess he might have had some inside information. It’s the slime oozing out inconveniently for Kaiser Quisling and his palace from under the rock where they thought they hid it deep enough. If the transfers were done normally it would be visible (and we have 5, so far). However, I wouldn’t put it past Parscale to know about bitcoin enough to move things using that route as well just to keep it supersecret. I’m still baffled that no apparent attempt to talk to Parscale has been made by the OSC. We also may get more once the Mystery Appellant bank is revealed and why they dug in so hard. Parscale’s omission is even more interesting given the focus about the counterintelligence side of Mueller’s investigation. Maybe Adam Schiff is trying to hold the cards closer to the chest, but IIRC the intel committees didn’t ask to hear from Brad either. I’m quite certain he’s very much going to be in the crosshairs when it all goes down. He lies slightly better than Tr*mp, but no more believably. Who are you referring to when you say Kaiser Quisling? Kaiser – partly because of his claim of absolute authority, but also because his actions mirror that of Wilhelm II, the last Kaiser. Quisling refers to Vidkun Quisling of Norway’s wartime infamy. In this case Vlad stands in for Adolf. For a while I was posting the name in Cyrillic. A history prof of mine used to tell of ‘wild tales’ leaking darkly out of the German court that Kaiser Wilhelm liked to dance in a tutu (see Wikipedia, and note his role in instigating WWI). But only at court, and none of the courtiers had the nerve to tell the autocrat to conduct himself in a manner more befitting his authority and responsibilities. Although scandalized, they were helpless to stop him. He was possibly stark raving bonkers at times. None of his entourage succeeded in reining him in, nor getting him the type of help that he needed. They were a pack of lickspittles, incapable of correcting the autocratic Kaiser Wilhelm. Thus, the moniker ‘Kaiser Quisling’ resonates on several levels. A ‘quisling’, as you may be aware, is a traitor. Enjoy some kimchi on my behalf, Seouljer. Funny how many Russians have been involved in influencing U.S. politics and every last one of them swears they have nothing to do with the Kremlin. On another note, I’m reading a book about the FIFA corruption scandal. Global soccer officials have long taken bribes to award television and sponsorship contracts, and laundered the money to hide it. Dozens of FIFA officials were indicted in 2015. The guy who got the investigation started was Chuck Blazer, a small-time con man from NYC who rose through the ranks of the US organization as soccer became more popular and more money was involved. I bring this up because years ago, Trump gave him free space in Trump a Tower to run the US soccer organization. Some of the bribery involved Russian mobsters and sheiks from Qatar (which won the “bidding” for the 2018 and 2022 World Cups). There is a throwaway line in the middle of the book about how coincidental it was that so much of the corruption involved people who had connections to Trump Tower. A safe place for them to work – they thought. Maybe he assured them the government didn’t (or couldn’t) bug his building. It’s like a B-movie, or Carmen Sandiego, where the villains have a headquarters. I wonder how many counterintelligence operations and FISA warrants are based in the tower, could bug the whole building and listen in on a thousand criminal operations. FYI, HBO is making a movie based on a book about Chuck Blazer (maybe the one you’re reading) with Will Ferrell (?!?!??) in the lead role. Yes, that is a strange coincidence, isn’t it???? You know what’s even stranger? Our friend Chris Steele was the British intelligence agent that helped the FBI blow the whole case open. Also, I hate to keep repeating this, but QIA (my bet for mystery appellant) owns 9% of Brookfield Asset Managment. BAM bailed out Kushner at 666 5th Ave. BAM also owns 100% of Westinghouse, which is the American reactor brand that Flynn et al. were pushing for the Middle East plan. QIA also helped finance a 19.5% sale of Rosneft in Dec 2016, which was highlighted by some hinky transactions by VTB, a sanctioned Russian Bank (the bank of the oligarchs). It is unclear right now, how much of that 19.5% stake QIA actually owns (or whether it’s still all really under Russian control). Also, just found out this tidbit, in 2013, QIA also purchased a $500 mil stake in VTB as well. So there are ties both ways. Finally the strangest of coincidences, on April 5th 2018, Michael Cohen was meeting with Qatari economic minister and deputy chairman of the QIA as well as Franklin Haney, the owner of a stalled nuclear power plant site in Hollywood, Alabama. Haney also was a recent convert to Trumpism, having given $1mil to the inauguration committee and $125K to the RNC in 2018. Prior to that, he had been a big Democratic donor. Note that the FBI raided Cohen’s properties on April 9th, just days after this Qatari meeting. Those are some great nuggets pulled together very well. I would think that the US IC (as well as many others) have done some good cause/effect linkages already. Also, I think it becomes apparent that the word “mob” can be applied to (some of) the sheikdoms. Brothers in blood, brothers in crime. lots of ties between thomas barrack/colony capital and QIA. Last year, Barrack helped to recruit his longtime close friend, the former lobbyist Paul Manafort, who had a history of lobbying on behalf of Russian and Ukrainian interests close to Vladimir Putin, to join Trump’s campaign. Manafort served as the campaign’s chairman before he resigned. Manafort, who went yachting on the Mediterranean with Barrack after his departure from the campaign, is now a key figure in the FBI’s investigation into alleged collusion between the Trump campaign and the Kremlin. The Italian investigation into Barrack’s financial activities in Sardinia is unrelated to Trump and Manafort. But it relates to Barrack’s dealings with Qatar, and Barrack – who speaks Arabic and began his career working for the Saudi royal family – is seen as having influence over Trump’s Middle East policy. Barrack’s business ties to the Qatar Investment Authority (QIA), the sovereign wealth fund, and its 2012 purchase of four luxury hotels and acres of undeveloped land in Sardinia, which were acquired through a subsidiary of QIA, are now under intense scrutiny. Details of the allegations are complex and involve several entities that are based in Luxembourg, a tax haven, and the US state of Delaware, where many shell companies are incorporated. Deutsche Bank, which also serves as a private bank for Trump and his close family and has been mired in legal troubles in the US, advised Colony on the deal. Thanks, @viget, for reminding us of the QIA-related threads that remain to be fully unravelled. The sale of 19.5% of the assets of Rosneft was the privatization deal that according to the Steele dossier, the CEO of Rosneft, Igor Sechin, offered to Carter Page in July, 2016. This article in the Hill Reporter https://hillreporter.com/fall-trump-power-rise-rosneft-deal-17323 makes the case that the brokerage fees from the Rosneft sale may have been intended as a “replacement” for the Trump Tower Moscow deal that had to be abandoned after Trump won the nomination, the DNC was hacked and the increasing scrutiny of the Trump campaign made it too risky for Michael Cohen to go ahead with his planned trip to Moscow in June 2016 to finalize the deal. Both the Trump Tower deal and the Rosneft deal would have brought in about $300 million to the Trump Organization coffers, assuming a 3% brokerage fee. The sequence of events in June and July 2016 is interesting in light of the “replacement” theory. The sale of the 19.5% of Rosneft assets to QIA and Swiss company Glencore went forward in December, 2016. The Russian bank VTB, which was to have financed Trump Tower Moscow, financed QIA’s share of the deal (apparently through a complex web of shell companies), yet refused to acknowledge that it had. A few days after the sale was announced in December 2016, the head of the relevant division of QIA, Ahmad al-Rumaihi, visited Trump Tower and seen hobnobbing with Trump, Michael Cohen and Flynn. Six months later, the Russians bought back the shares from QIA. “Could this sale, and then the quick reversal, have simply been a means for Russia to funnel those brokerage fees on the 19% sale of Rosneft to Trump and his campaign associates like the dossier suggested had been offered? It definitely seems possible, and without a doubt, the special counsel is looking into the deal. Hoping these questions will all be answered soon. Two things I am watching for: when Parscale’s name surfaces and how Fox news spins it. And now that Paul Ryan has joined the board of Fox, the parent company of Fox News, I’m not counting on much. The search warrant evidence demonstrates that Trump was desperate in October 2016. Even though he knew Cohen was dirty and vulnerable, Trump used him to manufacture the payoff to Ms. Clifford. And by that time Cohen was recording Trump, probably on the advice of Pecker and based on personal experience. This illustrates two problems with criminal conspiracies. The participants are all criminals. The conspiracy is only as strong as the weakest person in it. Thanks for posting this material. But now, all mention of his name has been scrubbed from MIT records. The worries are that Russia was interested in stealing tech. Radio Free Europe / Liberty (rferl.org) must stick in the craw of the despot-wannabes. I hadn’t looked at their programming in years but it seems to be more factual and investigative than many US gov’t organizations. This on top of Stewart and the rest of the night comedy crew speaking the truth of Shrub’s WH when the MSM wouldn’t touch it. I just looked up the definition of ‘Bad Week’ on Urban Dictionary and the top definition is “When your picture is at the top of the three most recent postings at emptywheel dot com. Maybe someone can clear this up for me. After the evidence was taken, if another set of investigators wanted to see the evidence, would that show up in the documents released here? Is there some other set of documents that would reveal it? I’m curious if a redaction would only apply to activity involving Mueller or SDNY, or if (at least in theory) some other investigators might ask for the redaction. No. It would not show up. I’m certain that Mueller obtained their own warrant of the seized material. But you’re right: other investigators could obtain it as well. Thanks. I know the rules around search and seizure are complicated, but I assume they would be vastly more complex here compared to a simple burglary case. I’m surprised there hasn’t been more focus on the huge redaction of the entire section called “The Illegal Campaign Contributions Scheme.” Some folks who have written about it are assuming this is only about the hush money payments, but I doubt that’s the whole story. Cohen already pled guilty to campaign finance violations, so why would the entire section need to be redacted in full if it’s only about the well-documented Stormy Daniels issue? As just one example, Cohen was also Deputy Finance Chair of the RNC, alongside Elliott Broidy of all people – there are way more skeletons in this closet. Kellyanne’s luuv triangle going pearshape. Hush money broker needed? So these are some of the same bank records that the IRS employee leaked to Avenyetti… Are there any discrepancies worth noting? That’s a lot of money going in. Am I missing something (like it is all still in the account) or is there no information on money going out except to Stormy Daniels? Didn’t Cohen owe money to the bank for the initial loan to set up the LLC that this money was passing through? Supposedly that would be paid back in monthly installments? So that must mean that Mueller isn’t done with Gates in the near future- if he was going to issue an indictment next week, Gates’s lawyer would probably just ask for a two week extension- but he probably will be within a few months.